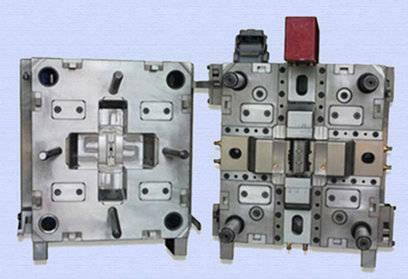 Aco Mold established in 2000, one of the most competitive mold manufacture and plastic injection molding company in Shenzhen, China. we serve a wide range of industrial, including household application, auto, electronic, medical, agriculture etc. Address Buliding A, Fengzheng industrial Park, Fengzheng RD, ShiYan town, Bao’an district,Shenzhen,Guangdong, China. Plastics flow behavior involves a combination of flow, pressure, cooling and heat. When you alter any influence on this complex combination (for example, part geometry, runner system or cooling system), the injection molding behavior may change. The gates must be placed at the most appropriate and feasible locations to allow enough melted plastic to fill and pack/hold into the mold cavity. This happens to white components if the injection barrel temperature is properly set( set on higher end) or if the time spent for the material to be in the barrel for a longer time during the curing process of the first shot. Check your barrel temperature suggested by the material supplier and try to maintain on the lower tolerance than on the higher tolerance. Also check for barrel temperatures, keep back pressure moderate..not too high in your case, lower injection speed, check for melt cushion (In general it should be between 4-8mm for thermoplastics)....Finally check if material drying temperature is not too high! 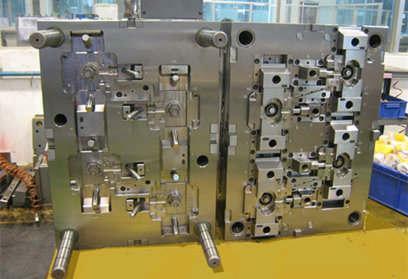 Our tool room have CNC, EDM, WIRE EDM and CMM and Production plant have 20 TONS -650 TONS injection molding machines. 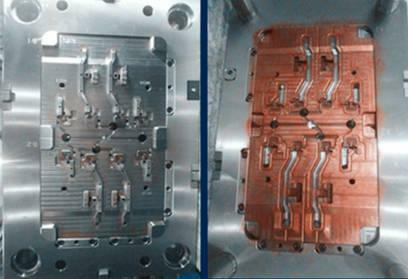 We have experience in singapore, malaysia and india mould design and project. 1. product design: the part thickness should be similar all over the part (there are no extreme different thickness ). for boss thickness, It has it own formula. (thickness at boss = 1/3 up to 2/3 part thickness. 2. Mold cooling lay out should balance. 3. Injection parameter. you should find enough part density. Set pressure, speed and holding time. Our plastic injection molding factory in China manufactures very high quality plastic products that are extremely cost effective. Our warehousing and distribution facility in Austin, Texas, also allows us to service custom plastic injection molding projects in Dallas, Houston, San Antonio and other cities across Texas and the entire USA very easily. We've molded parts as thick as 50 mm with long cycle times, cold molds and l long ram-forwsrdv times. 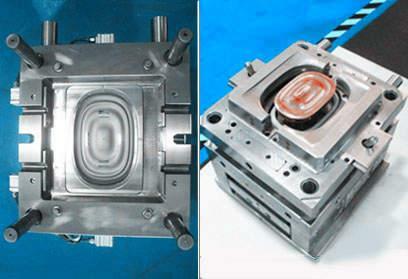 Thicker parts can molded with compression mechanisms in the mold (coining). One can also extrude material into the mold cavity then inject material behind it to get thick parts. It's smarter to design yeour product usinner components. We also molded using an injection molding process. This process is a thermoset process where liquid silicone material is supplied through an injection nozzle. The liquid silicone rubber is mixed in line with the curing agents and is injected into the mold cavity using a cold runner to prevent adhesion to the screw. The liquid silicone enters the cavity of the mold and fills the predefined shape. Under heat and pressure, the rubber cures. The part is then ejected from the cavity and the LIM molding cycle restarts. Follow Aco Mold on Facebook. Watch your plastic injection mold wall thicknesses and radii where you can get them instead of sharp corners; mill time, cheaper than burn time. 1. To make the wall in consistent thickness, it can avoid the sink mark on the part surface during the injection molding. 2. 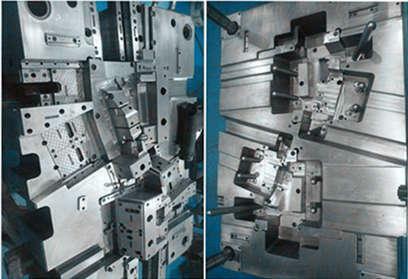 Try to avoid any undercut, which may require slides on the mold making, causing the mold unnecessary complicate. I read film extrusion vs an injection problem guys and gals. Having had the same problem I again say flat to flat surfaces rarely bond well - you may try a serrated common surface to increase the bond surface area and channel trapped gases to escape. Check also if your mold vents are sufficient vs blocked and allowing an intersurface of trapped air. If they are open try slowing down the rate of co injection to allow trapped gas or air to escape - a little trial and error should give you the optimum timing for max bond. Optimizing the choice of metal to be used for the cores and cavities and the design of the cooling lines represents 50% of available cycle reduction. The other 50% is analyzing and optimizing how the cooling lines are connected to the plant cooling system. we went to the virgin material. with 4 lb parts it saved us alot of money and used the scrap. Some materials like FEP, PTFE and others will generate tons of acid if run wet and therefore must be dried even if your only molding scrap. Back to the original question. Another trick I've used is to run the "start up" mold temp higher to get the tool up to temp and stabilized faster. After the very first shot, drop it back to the normal set point. To find the "start-up" mold temp, run the tool for a few hours and do an accurate steel temp of the core directly after part ejection. A customer was ordering plastic injection molded parts and mounting several labels and a membrane switch on the unit at their facility in Milwaukee. RSP was able to supply the customer the plastic mold maker in China, membrane switch, custom plastic injection molding and labels together on the unit eliminating 3-4 minutes of assembly time from their production line and saving them thousands of dollars a year! Call us today to see how affordable and easy plastic injection molding projects can be when you work with a US factory manufacturing in China. Tools, equipment, and supplies for industrial fabrication, assembly, and prototyping. Machine tools are power driven machines used to cut, form, or shape metal and other materials. Extruding, casting, forging, compacting, heat treating, molding, rolling or other processing machines and components used for metals, polymers or other materials. Plastics, elastomers and polymers are organic synthetic or processed materials typically consisting of thermoplastic or thermosetting resins that can be made into or supplied as shapes, film, sheet, rod, tube or fiber.